Are you vulnerable to a brownout or power surge? At a meeting, a speaker asked how to avoid “coverage misunderstandings.” One agent spoke up and said “R.T.D.P. !” Puzzled, the instructor asked, “What is R.T.D.P. ?” the agent replied “I tell my clients to Read The Dang Policy…” Smart advice, but there is one problem and that is that insurance policies are often hard to understand. This is why you MUST be insured with a skilled insurance agent. There is perhaps no better place to start reading policies than the property insurance policy. For example, a standard commercial property insurance policy excludes certain mechanical failure, damage to electrical motors, boilers, compressors, or electrical components caused by a drop in a electrical phase, brown out, power surges, damage caused by an animal, or even unknown causes! But hold up now… Just like the property policy, these policies also have exclusions – like wear and tear. Wow – think about that, a property policy that does not cover the major components of a building for certain types of destruction. Well, there are just certain exposures that all insurance companies are not willing to cover without a coverage enhancement and premium. 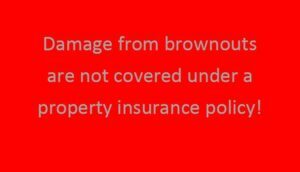 To reverse many of these exclusions you need to have a form of Equipment Breakdown coverage (and a great insurance agent). Sadly, many insurance agents do not review these exposures with their clients. Gladly, that is where we can help. If you are a banker, CPA, attorney, or other professional that advises businesses in some capacity, share this post. There is a heck of a chance your clients don’t know about this landmine AND an uncovered loss can cost the business owner their entire net worth!